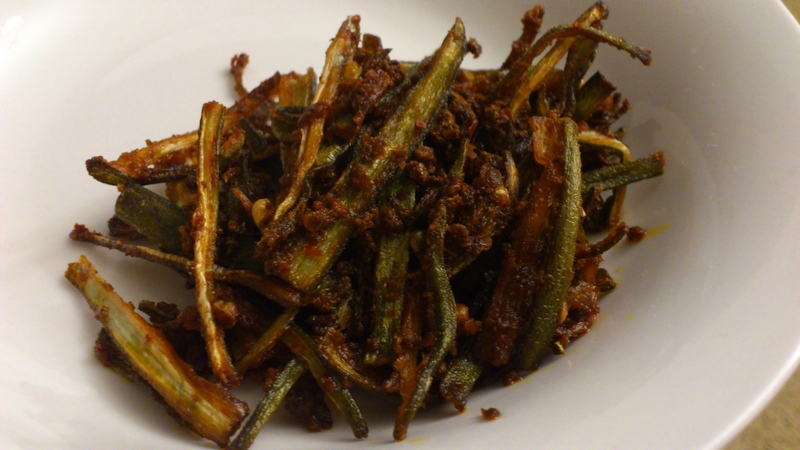 1) 1 cup of okra cut into thin strips [see here]. Mix all the ingredients together except the olive oil. Then in a pan under medium high heat heat the olive oil and fry the okra until nice and crispy. Be careful it doesn’t burn. So just enough for it to turn crispy. Serve warm as a side to you favorite dish–as I said I like this with fish kebab sauce on a bed of rice cooked with lentils. Did you try it Zainab? Next time let them get crispy in the oil ( careful they don’t burn) and let drain on a paper towel. That way they won’t br greasy insha Allah. This looks delicious! I love okra but never know what to do with it except to make bamia. Do you need to wait until the oil gets to a certain temperature like for deep frying? Thanks for sharing. How do you make your Bamia Julie? You need to wait just a little for it to get hot. Just so that when you put the Bamia in it sizzles right away. Thanks, that does help :) I make my bamia Iraqi-style- okra in a tomato/lamb broth base with cubed lamb. I’ll have to put the recipe on my blog soon inshAllah. Insha Allah. And what is the link to your blog?